Lower slopes of Mount Sharp appear at the top of this image taken by the right Navigation Camera (Navcam) of NASA's Mars rover Curiosity at the end of a drive of about 135 feet (41 meters) during the 329th Martian day, or sol, of the rover's work on Mars (July 9, 2013). NASA's Mars rover Curiosity is pressing forward with an epic Red Planet road trip, a long-distance drive aimed at the central mountain of the robot's landing site. Curiosity began its long Martian drive on July 4 and completed three separate trips in the days that followed. On the third leg of the 5-mile (8- kilometer) trek, the car-sized rover covered a distance of about 135 feet (41 meters), NASA officials said in a status update. Curiosity is the centerpiece of NASA's $2.5 billion Mars Science Laboratory mission. It finished work at its first major science destination, an area known as Glenelg, last week. The rover is now headed southwest for the foothills of Mount Sharp. Once there, scientists hope the 1-ton robot will find clues about how Mars' ancient environment changed and evolved. Curiosity kicked off its long drive kicked on July 4 with a 59-foot (18 m) trip, which was followed by a July 7 haul that sent the rover 131 feet (40 m) closer to Mount Sharp. The third drive, on July 9, brought Curiosity's odometer reading to about 325 feet (99 meters) since completing the Glenelg investigations, according to NASA. Though Curiosity is not bound to a strict timeline for its trek, mission officials have estimated that it will take about a year to complete. The progress of the drive will depend on what Curiosity finds along the way, rover mission managers said. Curiosity already has accomplished the main objective of its mission, to find out if Mars is, or once was, suitable for life. 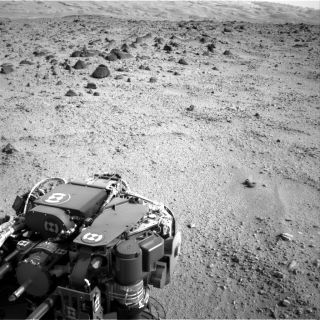 At targets in the Glenelg area, the robot drilled samples of Martian rocks that helped scientists determine that Mars could have supported microbial life in the ancient past. NASA's Curiosity rover mission is expected to spend at least two years exploring Gale Crater, with scientists planning to eventually send the rover on a trip up Mount Sharp.